SW Steakhouse is a classic American steakhouse with a contemporary flair. It's one of the most popular restaurants in Las Vegas, and deservedly so. If you'd like to know a little more about it in order to ensure you have the most pleasurable dining experience possible, please read on. Reservations are highly recommended for SW Steakhouse, as it is increasingly difficult to get a reservation there given its popularity, especially on weekends. 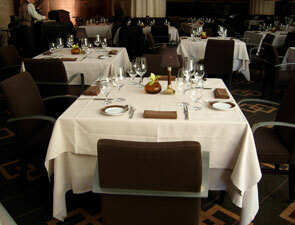 Your best bet, if you have a choice, is to take a late reservation or to dine during the week. Restaurant reservations are accepted 90 days in advance for guests of the resort and 60 days in advance for those not enjoying the amenities of Wynn Las Vegas. You can reserve by calling the restaurant directly at (702) 770-3325, or by contacting Wynn Las Vegas Restaurant Reservations at (888) 352-DINE or (702) 248-DINE from 6 a.m. until 10 p.m. daily. Seating is comfortable with upholstered chairs and banquettes. The tables are spaced nicely and one has no problem navigating between them. The atmosphere at SW Steakhouse is sophisticated and elegant, yet lively. Even after 10 p.m. on a weeknight guests are coming in for dinner. There is light music playing, but it's usually drowned out by the liveliness of the guests. Tables are generously spaced and have plenty of room to accommodate all the side dishes that you care to order. Tables for two are generally rectilinear, measuring 29 inches wide and longer in length. Restrooms are easily accessible and within the restaurant, at the front behind the bar. The dress code is casual elegant. While jackets and ties are not required, the hotel suggests casual evening attire. T-shirts, tank tops, shorts and athletic shoes are not appropriate. Complimentary valet parking is available at the hotel, as are taxis. However, if you're ending your meal at the same time as one of the shows that's playing at the hotel, such as Le Reve or Spamalot, you might want to note that it will take a little longer to get your car, or enlist a taxi. Las Vegas Life Epicurean awards, Best Steakhouse, 2007; James Beard/Perrier-Jouet Rising Chef Award, three-time nominee; AAA, Five Diamond Award; Mobil, Five-Star Award.